Kevin Eastman and Peter Laird are a classic American success story. They parlayed a strange concept–a comic parodying Frank Miller’s then-popular Daredevil and Ronin comics, but starring anthropomorphic animals–into an empire, with profits that at times exceeded those of the mainstream publishers whose works they were parodying. It’s hard to know where independent comic publishing would be today without the immense success of the Teenage Mutant Ninja Turtles. Like many of my generation, I was first introduced to the TMNT by the cartoon (or rather, by reading a comic based on the cartoon, but not the original Mirage comics). To say I became a Turtles fan is an understatement; my life from late 1989 to early 1991 was dominated by them. The story of my Turtles fandom is a tale unto itself, so I’ll just say that, while I loved the cartoon and the toys based on it, I also read some of the original comics and really enjoyed them, particularly since the Turtles didn’t hold back. 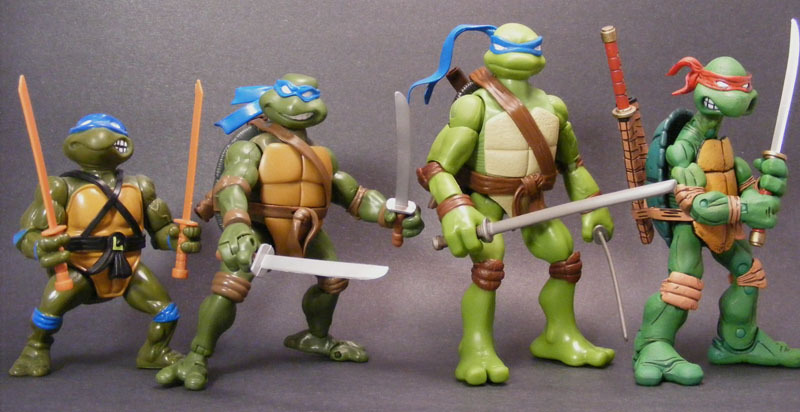 In the cartoon, Leonardo carried two ninjaken (ninja swords), but he never hit anyone with them. In the Mirage comics, his enemies weren’t nearly as lucky. 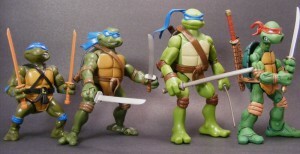 I lost my fervent interest in the Turtles eventually, but I always wished for action figures of those original, no-holds-barred TMNT–the one who all had the same color bandanna (red), no pupils, and no colored pads. As time went on, I decided such figures would be even better if they were super-articulated, like a Marvel Legend. 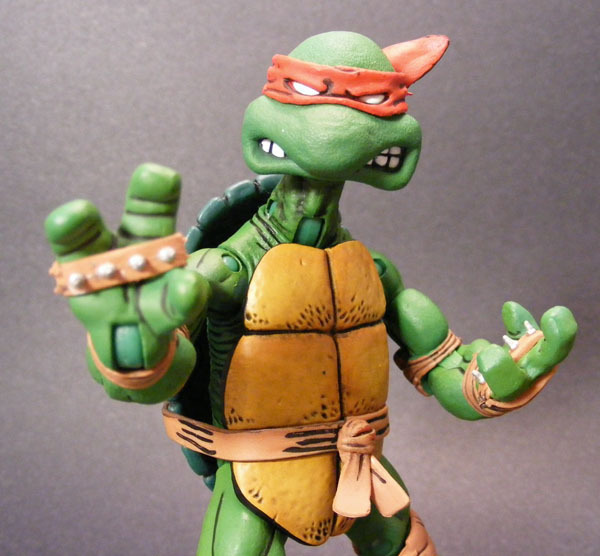 And if Raphael could hold his sai between his fingers, well, that would be evidence of some incredible toy-making. 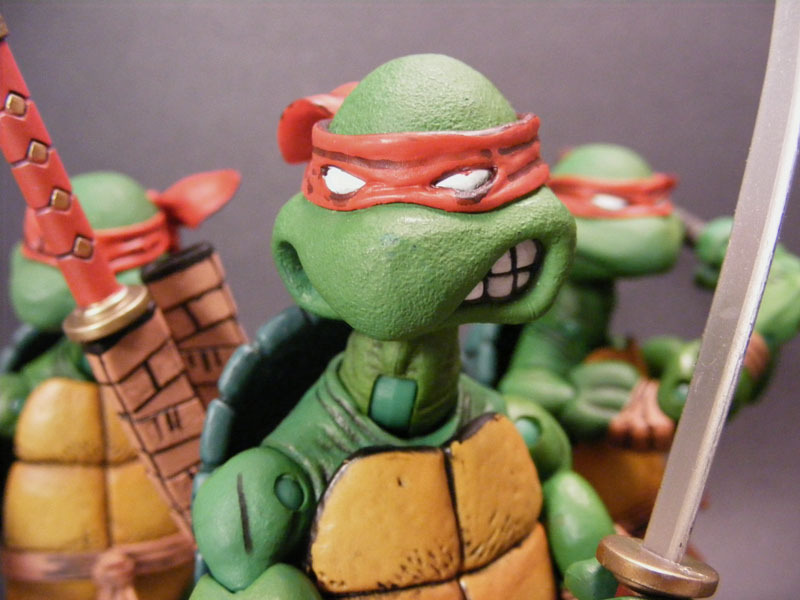 There are several different ways to get your set of NECA TMNT. The single-carded figures, which are what I got, comes with display bases, alternate hands, and extra accessories. If you only want the Turtles and their signature weapons, there’s a box set available at most retailers as well. I got my set of singles from BigBadToyStore. But if you can hit the New York Comic Con this weekend, NECA will be selling an exclusive box set available that contains all the bases and accessories. It sells for a mere $50, but it’s limited to 500 pieces. On to the review! 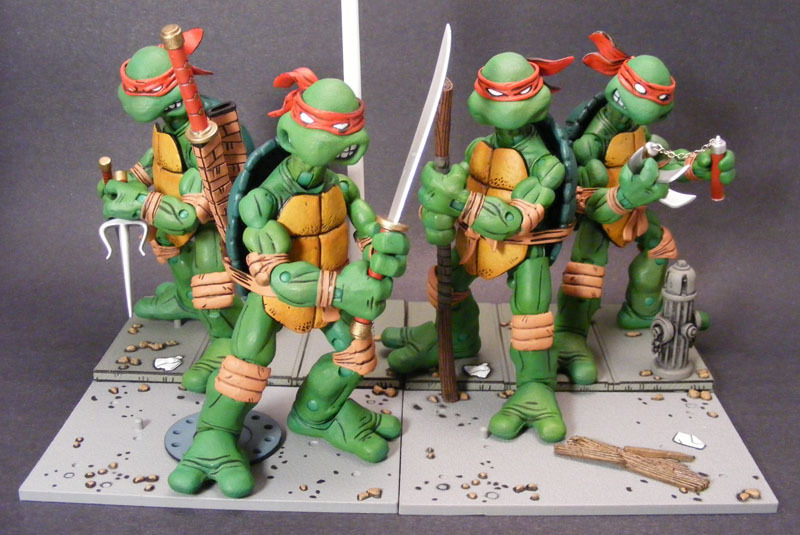 I’m going to be reviewing all four Turtles as one unit here, because they all utilize the same basic sculpt, with variations only in the heads and belts (as well as the accessories and bases, obviously). Packaging: The Turtles come in attractive clamshell packaging with some reproduction graphics from the original comics. Each package also features inserts unique to that character–important when 80% of the sculpt is identical. Sculpt: The credits at the bottom of the packaging say it all: Four Horsemen Studios. I’d stop there, since I don’t really know how to keep going without this becoming a rave review, and then I might lose a little of your respect. The sculpting really is amazing. The Horsemen have perfectly captured the early comics art while not going too far in mimicking the roughness of it (Eastman and Laird’s art improved dramatically over the course of the comics’ run). It’s always tricky to capture two-dimensional characters in a figure sculpt, but fortunately the Horsemen had decades of toy history to go on. 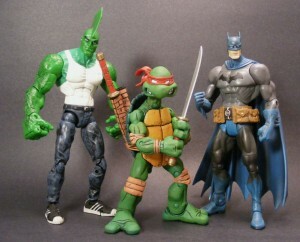 Yet they still managed to carve out their own distinct niche in Turtles figure-dom. My favorite little bit: the tails, which were dropped from the various cartoon incarnation (except for villains like Slash, oddly enough). The figures have some great textures, as well not unlike Palisades’ Muppets figures of a few years ago. The heads are slightly rough, while the muscles are sleek and the inner shells are just a bit shiny. The only real differences between the sculpts are the heads. Leonardo looks determined; Donatello contemplative; Raphael angry; and Michelango goofy. Leonardo has one other feature none of the other figures have–scabbards for his swords on his back. This is accurate to the early comics, where he had a way to hold his weapons but none of the other Turtles did (initially). Also, in those first comics, Leonardo (and Donatello) did not have the shoulder strap seen in almost every other incarnation, so again, this figure is accurate. While the figures do have peg holes and the bases have pegs, the figures’ big, flat feet make them stand solidly, though the pegs come in handy for action poses. The figures are approximately 5.25″ tall, which makes them just a little bit bigger than 1/12 scale. As you can see, they look okay next to similarly-scaled figures, but I think they’re a bit too bulky for a perfect fit. Still, if you’re not picky, these will look very good next to your Marvel Legends or Legendary Heroes figures. Perhaps the highest praise came from my fianceé, Mrs. Ghostal-to-Be, who wants it known that she was amazed by these figures. “They look like they stepped right out of a comic book,” she said. Plastic & Paint: NECA often uses a more brittle sort of plastic in their toys, which can capture small details well but is best used on figures that won’t be played with much. Not so on the Turtles. These are super-articulated, cartoony figures, and as such, much of their construction is made from a more rubbery, pliable material. This is particularly evident in their belts, pads, and shells. It’s also readily evident in their hands, which often have to be bent a bit to fit their weapons. And then there’s Jon Wardell and Geoffrey Trapp. They’re the men responsible for the paint applications on these figures, which make them instead of breaking them. 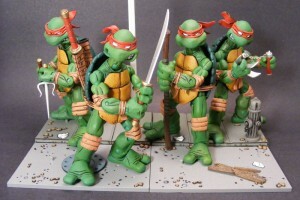 This is the action figure equivalent of cel shading, and the primary reason these figures look “like they stepped right out of a comic book.” The effect is created through the bright, flat paints and the detailing, as the Turtles’ muscles, shells, bandannas and pads are etched with black lines like those in a comic drawing. While the detailing may irk those who prefer a more naturalistic look, I think it was the right way for NECA to go. 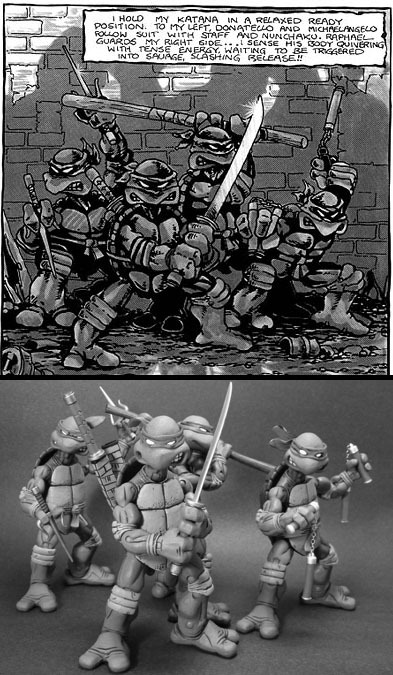 The original Mirage comics were in black-and-white (and there will be black-and-white versions of these figures available later), but the colors of these figures match those used on the later Mirage covers and represent the Turtles as they’ve looked for much of the Mirage run. All that said, I do have one small complaint: my Leonardo figure has some bleed beneath his left eye, making it look like he’s getting ready to play baseball. Something to watch out for. In short, they’re as articulated as most any Marvel Legend. Most of it works very well, particularly the arm articulation, which allows Leonardo or Donatello to hold a weapon with two hands. The ball jointed head and swivel-and-pin neck make for some of the most expressive action figures I’ve ever seen. The waist and abdominal articulation are limited by the shells and belts, but there is some wiggle room in there. Accessories: Wow. Here I’ll have to break it down by character. 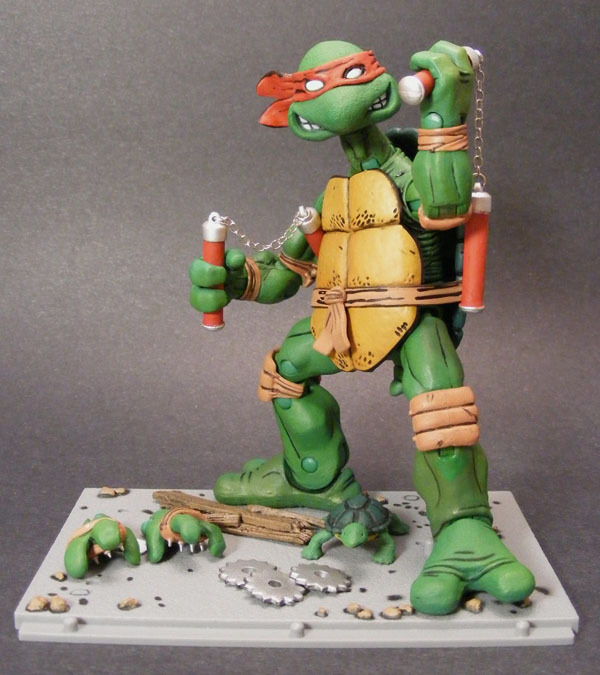 Leonardo comes with the “fire hydrant” part of the base, as well as his two ninjaken, a little baby turtle, and two alternate hands fitted with ninja climbing claws. 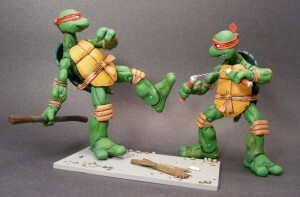 The pommels of the ninjaken can be removed to make it easy to fit the weapons into Leo’s hands. As mentioned above, the grip is long enough that he can hold a single sword in both hands quite easily. The base has the same excellent paint work as the figures themselves, and the little baby turtle is…really cute. 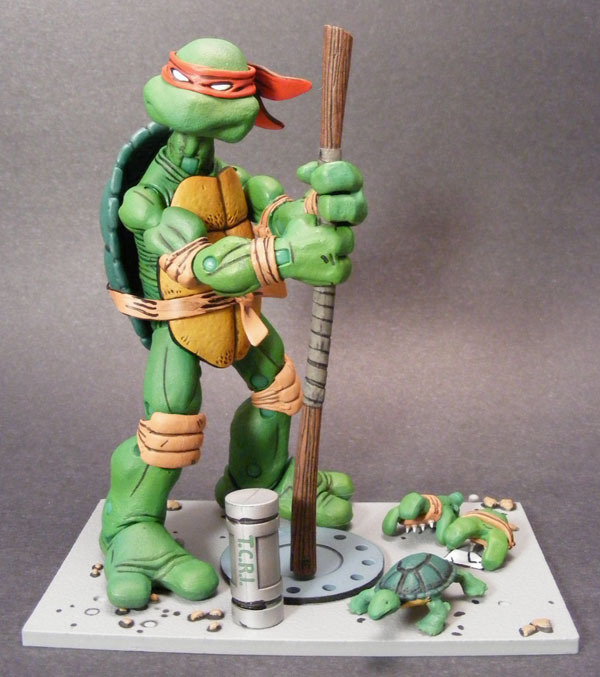 Donatello comes with the “manhole cover” part of the base. He has the same accessories as Leonardo except for his bo staff and a can of T.C.R.I. mutagen ooze. Like the swords, the bo staff can be taken apart to fit into Don’s hands more easily. 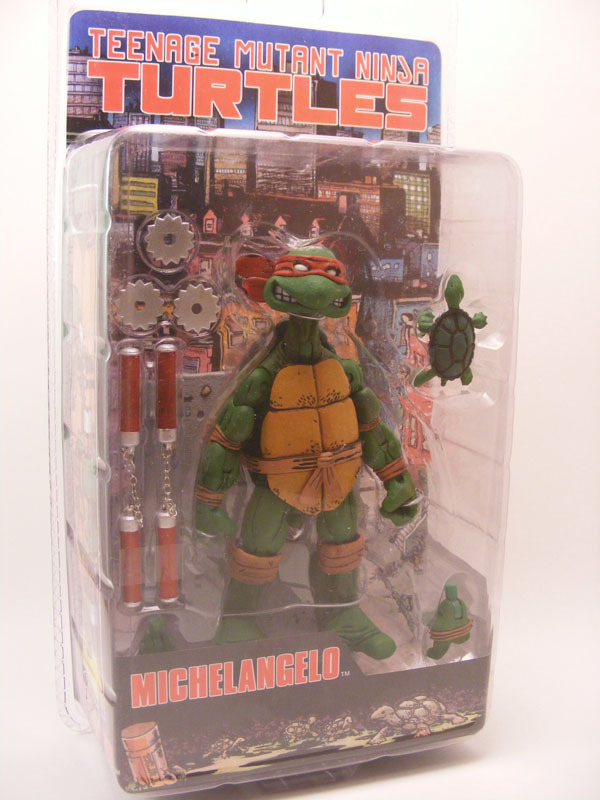 Michelangelo comes with a base with no distinguishing features. He also has his two nunchaku, which are connected by a metal chain; three star-shaped shuriken; and the usual baby-turtle-and-ninja-claws. One of my favorite things about Mike is, thanks to his articulation, he can tuck one of his nunchaku beneath his arm. 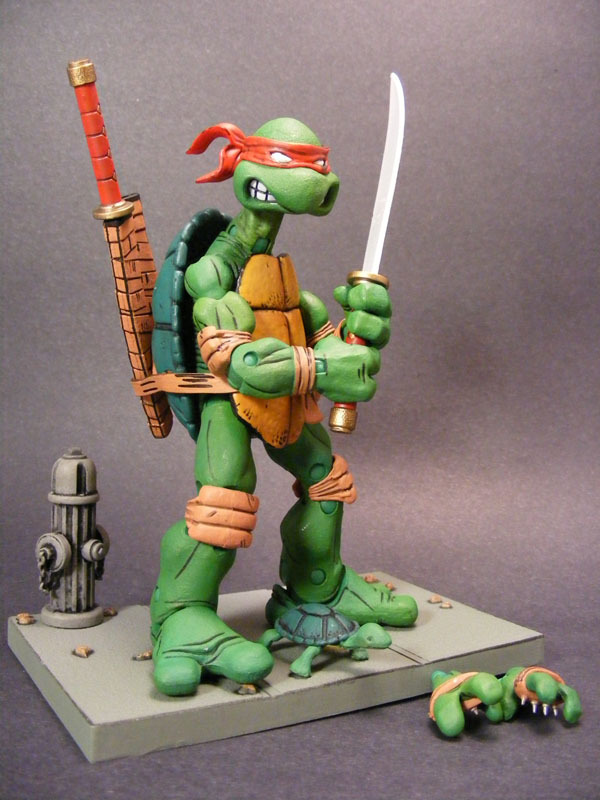 Raphael comes with his two sai. His hands are sculpted with extra space between his fingers, so the sai can be easily held between them, allowing Raph to do something no previous Turtle figure has been able to do. 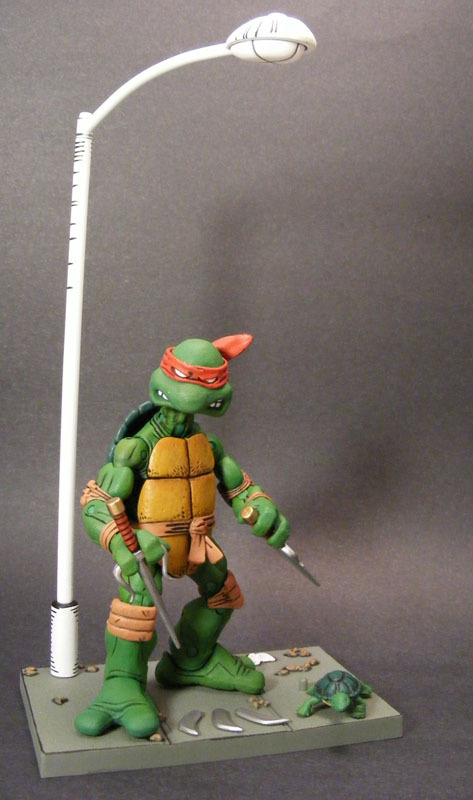 In addition to the baby turtle and the climbing claws, Raph has three blade-shaped shuriken. He also comes with the “street lamp” base. I initially thought the lamp was an error, and had been painted as if it were part of the aforementioned black-and-white exclusive, but apparently it’s accurate. Quality Control: I had only one real issue with these figures: the left hands on my Raphael and Donatello figures pop off very easily, which becomes particularly annoying with Don, who needs both hands on his weapon. It’s not a big problem, but it’s something to be aware of. Be careful putting Raph’s sai between his fingers. I imagine it would be very easy to put too much pressure and break off one of the prongs. It’s been reported that some figures have the wrong heads, so be sure to check the back of the box before you buy. The first Ninja Turtles action figures hit the market in 1988. Twenty years later, we’ve received near-perfect versions courtesy of NECA. Once in a while you come across a toy that’s the equivalent of a blockbuster film (like Masterpiece Optimus Prime), and these TMNT qualify. If you like the Turtles at all, I highly recommend these toys. Judging from the response online, the line seems to be selling well. Here’s hoping we see April, the Shredder, Casey Jones, and a Mouser or two in the near future. I stumbled on the entire set at FYE last night and had to pass it over so I could afford my fiancee's birthday present. Damned responsibility. Oh well, I got DC Armory Bats. –>> ..DECENT REVIEW , Mate !! Thnaks for the tip.. killer details .. best TMNT figs ever !! Nice review! 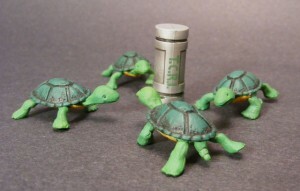 I want these just for their bases, and little turtle accessories. SO CUTE!! Excellent review. On your last pic, comparing the 4 Leos, what Figure is the second one? It looks like my 2003 version of Leo, but with much more articulation, esp in the ankle area. FYE still had them! I gots me some toitles! I went to Newbury Comics today for National Record Store Day, and picked up Raph & Don! I love the "Evolution of a Turtle" picture. I feel I should be excited or enamored with these figures and should want them but I'm non-plussed. I guess I grew out of my TMNT phase as opposed to my lingering Catwoman obsession since I was 5. Thanks for including a comparison shot with the Savage Dragon. The crossover comic had so much potential but ended up being really stupid. @Phil–That's the "Fighting Gear" Leonardo figure. It came with a bunch of removable equipment, but it also had better articulation than the standard figure. thanks for the review and the pics!